The Green Bay Packers entered the 2016 season with a lot of hope at Cornerback. Sam Shields was on the cusp of becoming a Pro Bowl player, and Damarious Randall and Quinten Rollins looked very promising entering their second year. By the end of the season, the position was arguably the worst unit in the NFL, and prevented Green Bay from having a chance in the NFC Championship Game. Through additions and internal development, the hopes of the 2017 season may rest largely on the Packers getting better production from their Cornerbacks. Bringing back Davon House was a solid move to start. While he never lived up to his contract in Jacksonville, Davon was a solid player and a veteran presence. He uses his strength and physicality to jam receivers at the line. He could be the Packers number one CB if necessary, but if he is forced into that role Green Bay is unlikely to be in position to win another Super Bowl. Kevin King provides all the attributes of an elite defender. He’s 6’3” with 4.4 speed, and he’s got great length and ball skills. If he can pick up on the fundamentals of the position and learn to deal with players who will be stronger than him initially, he could be the rare rookie who can start on the outside. Damarious Randall will look for a bounceback year. It was apparent in the playoffs that Randall’s confidence was shattered. Getting healthy and having a full offseason of motivation should help him get back to the promise he showed as a Rookie. I believe Randall will have a big year and become the slot corner the Packers will need. 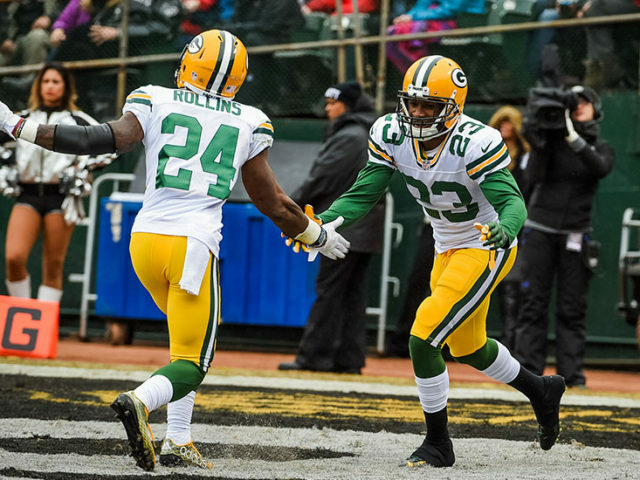 Quinten Rollins and LaDarious Gunter will be fighting for a roster spot. Rollins regressed greatly last season. He was sloppy with his footwork, and looked very unathletic (despite being a really good athlete). The expansion of his role seemed to be too much for Rollins, and he’ll have to have a big offseason to re-install the coaching staff’s confidence in him. Gunter was placed in a no-win situation. As a second year undrafted rookie, he was asked to cover the league’s top Wide Receivers week after week in the playoffs. He did an admirable job, but just doesn’t have the top end speed to do that consistently. Gunter can’t be the number one CB on your team if you want to win, but he has the ability to be a great depth player. Herb Waters may be the most talked about breakout candidate this season. The converted Wide Receiver has taken to the CB position quickly, and has a really good chance to make the roster. Demetri Goodson has been a good Special Teams player for the Packers, but has yet to make an impact on the defensive side of the ball. Josh Hawkins showed some promise as an undrafted rookie last year, and will look to make an impact on the active roster. Several undrafted rookies (who all have great names) will look to take a place on the Practice Squad: Lenzy Pipkins, Raysean Pringle, Donatello Brown, and Daquan Holmes. I think the Packers only keep 5 CBs on the Active Roster because they have so much depth and Safety, and Josh Jones may be able to play as a hybrid player (ala Micah Hyde). Regardless of who makes the roster, the Packers will need to see a massive jump in production from the Cornerback position to be a viable contender this season. This entry was posted in Andrew Mertig, Packers 2017-2018 Season and tagged cornerback, Damarious Randall, Daquan Holmes, Davon House, Demetri Goodson, Donatello Brown, Green Bay Packers, Herb Waters, Josh Hawkins, Kevin King, LaDarious Gunter, Lenzy Pipkins, Quinten Rollins, Raysean Pringle. Bookmark the permalink. Some solid points. But I disagree in the direction of the CBs. I think House sees limited snaps with Rollins and Randall once again resuming the top roles. King will slowly ease in along with Waters. Gunter is a great player but doesn’t fit in the defense. And Hawkins is a LB/S hybrid so he will be cut if they keep Burnett after this season. There is no way that TT is going to cut a second round pick in Rollins before his first contract is up. Andrew…Rollins not only will be on the Packers roster but he’ll play nearly as many snaps as Randall. Rollins had “Sloppy Footwork and looked Unathletic” for the same reason Randall looked like he didn’t want to be on a football field. If Randall gets the benefit of having an injury as an excuse then so should Rollins. Randall is a football player. Rollins…..not so much. He’s an athlete in pads. He’ll be on the roster, and when we start taking injuries he’ll get on the field. I haven’t seen anything from him in two years that makes me think we want him matched up good WRs. Look at is rating as a rookie compared to Randall. He was actually better than Randall according to PFF. Matter of fact, PFF had rated the Packers secondary BEFORE the 2016 season started like 6th or 7th in the NFL. Rollins according to them was the big reason. Go back and watch Diggs against Randall in week 2 last season. That was 2 weeks before any injury to Randall and he was torched. Just saying Randall shouldn’t be such a lock. Obviously as a 1st round pick he’ll get more rope. But I lost a lot of respect for Randall last season when he acted (more than once) like he wanted nothing to do with what was happening on the field. You’re fond of stuff from two years ago. I don’t think that House, or Rollins, is going to give us that much last year. As always, time will tell. And the fact that PFF ranked the Packers secondary 6th before the start of the season should tell you something about their predictive ability. The Packer secondary RIGHT NOW is unarguably weaker than the Packer secondary from last training camp. Yes, if King, and House, and Randall, and Rollins all stay healthy and play better than they have in the past then we’ll be fine. I think the odds of this happening are pretty extreme. Just saying Randall shouldn’t be considered a lock. He was torched last season by Diggs and that was 2 weeks before the injury. Randall looked like he wanted nothing to do with what was happening on the field last season. He was also quick to start pointing fingers at teammates when he blew a coverage as if he was saying “It’s Your Fault”. Personally I can’t stand that S***. OWN your poor play, just like you own it when you make a great play. I think you’re wrong about Gunter, Very good defender, smart, and tough. Tackles well and gets people on the ground. Profootballfocus rates House as the worst CB in the league last year based on a QB rating against him of something like 140. He is not a better option than Gunter. King may be a great player someday, but right now he’s an untested rookie. We don’t know if he’ll stay healthy (Rollins and Randall didn’t) and we don’t know how long it’ll be until he’s ready to match up against quality NFL WRs. Randall and Rollins had a lot of problems last year, both physical and mental. I have hope that Randall will be a decent nickelback; I’m not sure if Rollins is a football player or just an athlete in football gear and I suspect he’s not a real good football player. So, I’d see our starters on opening day, baring injuries, to be Gunter and King/House with Randall as the nickel.. IMO, that’s not a big improvement over last year, and that’s assuming nobody gets injured. if our pass defense is any better than low average this year, I’ll be surprised. Our CB unit is weak. Correct. I said many times, Capers complicated schemes and no pass rush may be our downfall again. The DB’a will continue to get torched in big games. Mark it!!! Go look at Houses 2015 season when the Jags played a man to man scheme. 23 pass break-ups, 4 interceptions, he was solid in man coverage. Last season the Jags switched to a zone coverage as their primary coverage and that’s not Houses strength. The Packers are best and prefer to play man to man. They switch to more zone when injuries set in or they don’t have the CB’s to hold up in man to man. House is definitely a better option than Gunter and it’s not that close. I like Gunter and would imagine he’ll be better this year especially not being forced to cover the opposing #1 WR.